Rolling Nowhere, my account of riding the rails as a young man, was recently released as an ebook. It’s pretty cheap to download it to your screen-thingy from the Kindle Store, Barnes & Noble, Apple iBookstores in 32 countries, Sony, Kobo, WH Smith in the UK and FNAC, the Diesel eBook Store, Baker & Taylor (Blio and the Axis360 library service), Inktera.com and Versent.com. At some of these sites no one has yet posted a review; please, dear reader, be the first! This leaves only Coyotes and Whiteout still unavailable as digital downloads. I’ll try to get those out there soon. I first read ‘Rolling Nowhere’ when it was first published ~30 years ago, then purchased it a couple years ago as a reprint. 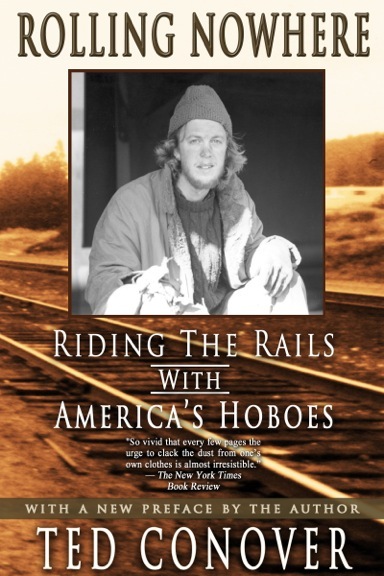 Conover does a great job exploring and explaining what its like to ‘ride the rails’ as a tramp or hobo. A great book.